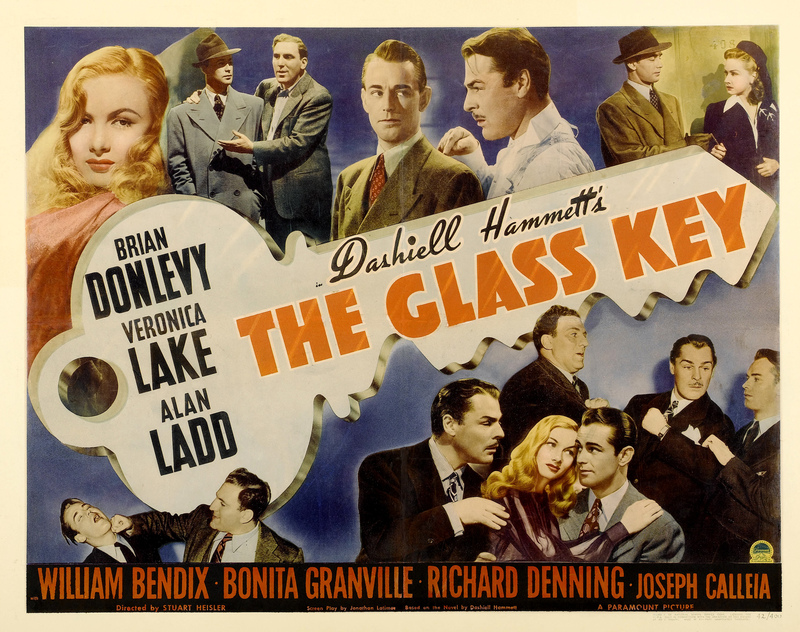 The Glass Key is an early classic film noir from 1942 directed by Stuart Heisler. This film is based on one of the greatest noir and hard-boiled authors ever, Dashiell Hammett. I have not read this book yet, but it is on my long “to read” list. I have read a few things from Hammett and loved everything I’ve read so far. This film is a very complex film, with many characters important to the story, as they all effect each other until we get to the bottom of the main crime. So I’m going to approach this a little different then I usually do. We are going to look at most of the characters and a brief description of what drives them. Ed Beaumont played by Alan Ladd: Ed is loyal to his friend, Paul Madvig, even though he knows sometimes this is not the best thing to be. He is also fascinated by our femme fatale for this tale Janet Henry. Ed is a smart man with many connections in the political world as well as the criminal world and bonces from one to the other with ease. Paul Madvig played by Brian Donlevy: Paul is a political powerhouse, but is well known to be crooked. He often answers questions with his fists instead of with his wits. He is a feared man in our city and plans on marrying Janet Henry. He also is helping Janet’s father get elected as governor. He is also overprotective of his little sister, who happens to be dating Janet’s brother Taylor. Paul does not like Taylor and thinks he is a bad influence on his young sister. Janet Henry played by Veronica Lake: Janet is our femme fatale, she is dating Paul, but plans on dumping him as soon as her dad is elected governor. She seems to Like Ed, but can do nothing about it until after the election. She is smart and beautiful and knows how to use both attributes to get what she wants for her and her family. Opal ‘Snip’ Madvig played by Bonita Granville: Opal is Paul’s little sister and is madly in love with Taylor. When Taylor ends up murdered, she believes her brother did it. Taylor Henry played by Richard Denning: Taylor has a gambling problem and owes some bad men some money. He uses Opal to help her get some cash after his family has decided to not help him anymore. Taylor ends up murdered and finding out who did it is the driving force of this story. Nick Varna played by Joseph Calleia: Varna owns a number of illegal gambling operations in the city. When Paul decides to crack down on crime in the city to help Henry get elected governor, Varna is his first victim. This happens even though Varna has been paying protection to Paul. “business is business and politics is politics.” Taylor Henry also owes Varna his gambling debts. Jeff played by William Bendix: Jeff is Varna’s top muscle. He likes to beat people up, but he has a hard time keeping his mouth shut. As most of my readers know I don’t like spoilers and don’t write any in my reviews. Hopefully this array of characters is enough to get you excited to see this film. Everybody is great in this, especially Ladd, Lake and Bendix. The story is very complicated but easy to follow. Hammett’s storytelling is some of the best ever. I really look forward to seeing more films with Alan Ladd and Veronica Lake soon and think they made a great pair. This is a must see for any noir fan, especially those of Ladd, Lake, and Bendix. It is also a must see for fans of Hammett’s books and work. You’ve definitely caught my attention. I’m definitely going to try to see this one, and soon. Really enjoyed the character overviews. I fell in love with this film, but didn’t know how to summarize the plot without giving everything away. I thought this worked better. Thanks for checking out my review. You will love this film! Natty writeup of a good movie that I prolly ought to rewatch soon. Anything with ‘Ronica in it is worth watching, so far as I’m concerned. Apparently she was called Moronica around the studios by the likes of Frederic March (she got merry revenge during the filming of I Married a Witch! ), but she had a screen presence that most of her detractors would have died for.